Although Facebook is still pretty new to me, I have made new friends! Last weekend when we'd put out our Friday Freebie for the Dresden Runner pattern, I "manned" the comments. I enjoyed visiting the pages of all the people who left behind comments, but one page from Małgosia Mianowska was especially interesting. 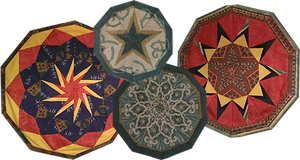 Obviously a young quilter and mother with two adorable small children, yet she found time to make so many beautiful quilts!! 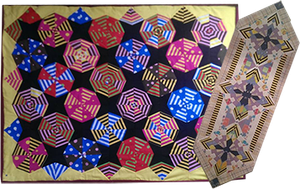 I was so impressed by her creativity and her obvious fearless approach to quilting. 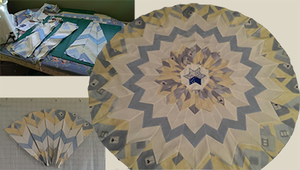 As I scrolled through her page I stumbled across photos of quilts she'd made using our Phillips Fiber Art tools. What a thrill! We've now emailed each other back and forth and she graciously agreed to let me share her work and her story. As a Christmas gift a year ago, her parents gave her her grandmother's 30 year old sewing machine. She enjoyed it so much she received a new one for her birthday last spring. Małgosia, originally from Krakow, Poland, moved from Ireland to the UK in the past year, leaving her friends behind. I've included a photograph of her workspace which appears to be in the dining room. 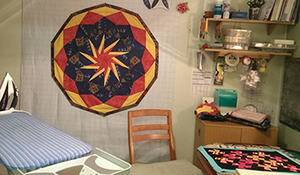 In less than a single year, Małgosia has made more quilts than many people make in a lifetime! 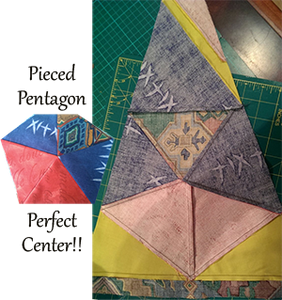 Although she calls herself a newbie, you can see that the projects she's tackled are not beginner projects. I am showing you several of the ones she made using my rulers because these are the ones that made my day! Be sure to check out the custom guitar case she made for her husband. 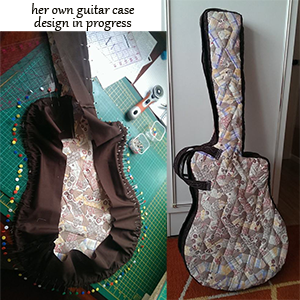 Here's a guitar case she made for her husband using her own design. This is someone we'll be keeping our eye on!! She'll be winning prizes and designing her own things before you know it!! Let's keep an eye on this lady! I see blue ribbons and awards in her future. I hope you've been as inspired by her creativity as I have been....also a weee bit jealous of all that energy!! 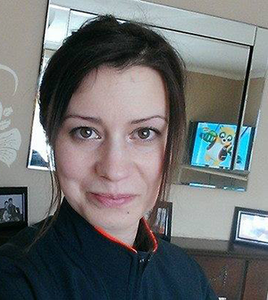 Thank you Małgosia for letting me share your story! Here are the ones that first caught my eye, Jewel Box Gems. Made by a new quilter with no instructor. I was impressed! Here are details of Malgosia's Moroccan Tile. Check out her Perfect pentagon!! You wouldn't believe all the many quilts she has made in just one year. She's so prolific! Mostly I've shared the ones she made using my tools, but she's tried so many things, hexagons, the twister, on and on.